ETB supply sets of instruments to OEM and individual customers, these accurate and high quality instruments are manufactured to customer order, providing an excellent choice of dial colours, outer bezels and pointer colours. These include - Black, White, Yellow and Magnolia. ..
All-in-One digital display system. The DigiDash 2 LITE is for road and track day use. The DD2-LITE is a stand-alone system supplied with its own set of sensors, including: coolant temperature, oil temperature, oil pressure, fuel level and speed. The system is a reliable, rugged and sunlight readable display suited for both normal road and race track use as well as tougher off-road conditions. .. Sensors for VDO Gauges ..
VAT - VAT (Value Added Tax) is the sales tax payable only by UK or European Union (EU) members. The current UK rate of VAT is 20%. 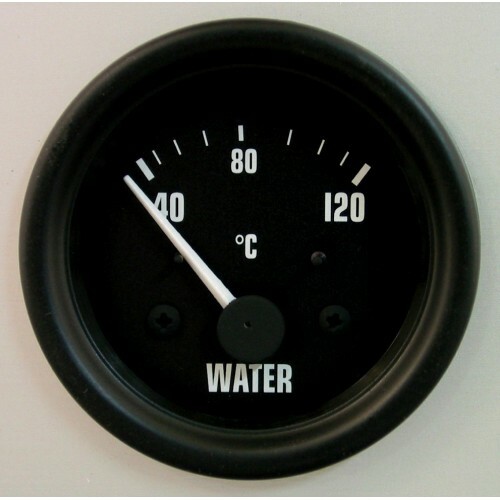 - If your order is being shipped directly OUTSI..
A 52mm water coolant temperature gauge produced in the style of the GT40. Electrical water temperature gauges indicate engine coolant temperature in degrees Celsius (°C). A matching ETB temperature sensor is required to provide the gauge with the correct input resistance. The gauges are supplied a 'U'-shaped fixing bracket and thumb nuts along with a 12v /2w illumination bulb. Night illumination is classic white. The gauge size of 52mm denotes the outer diameter of the main body of the instrument and hence a 53mm to 54mm diameter hole is required in the dashboard. 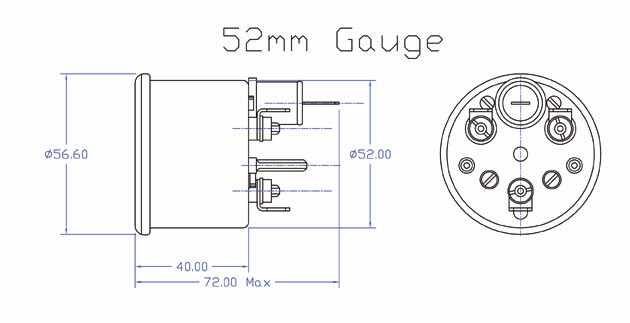 52mm Wiring diagram can be found here. 52mm Dimension Sketch can be seen here. ETB Instruments Limited, Unit 15 Brookside, Sumpters Way, Temple Farm Industrial Estate, Southend-on-Sea,SS2 5RR. Tel: +44 (0)1702 601055 Fax: +44 (0)1702 601056.